An hour before the sun sets at Indonesia, we disembarked from the public ferry transport along with a number of tourists ready to invade the island. The port area is a busy one and with luggage in tow, we tried to walk for miles to locate our transient abode in the island. After a series of inquiries from residents, we were told that our hotel is quite a distant and can be reached only through a horse-drawn carriage. Left with no choice, we rode the overpriced (on our standard) carriage and reached the hotel just before the sun sets for the day. Almost all tourists of the island travel to this part at dusk. Fortunately, we have the best vantage as the scenic sunset appears at the beachfront of our booked accommodation, the only five-star hotel in the island – Hotel Ombak Sunset. Horse-drawn carriages lined up in front of the hotel like a taxi lane in the metro is the first thing noticeable upon entering the hotel premises. An in-house restaurant (Horizon Restaurant) is positioned in the right side of the pathway leading to the reception area, where our complimentary breakfast is served; and on the left is the 40-meter swimming pool equipped with a jacuzzi and a small children’s pool. For a selection of light refreshments, mocktails and a light menu for snacks, the hotel has a pool bar named Blue Coral. For lack of itinerary for the day, there are times we simply keep afloat and lounge by the pool area. Checking-in was done swiftly with only the presentation of passports. Woodwork carvings of Indonesian accent were a standout feature of the reception area complemented by high ceilings and other traditional Indonesian ornaments. This is going to be a grand vacation. I told myself. And indeed it was. Gili Trawangan known as a party island, our room was a complete contrast being situated at the back of the hotel and away from the central hotel area for a peaceful escape. Every day, the route offers a scenic and lush tropical garden view. 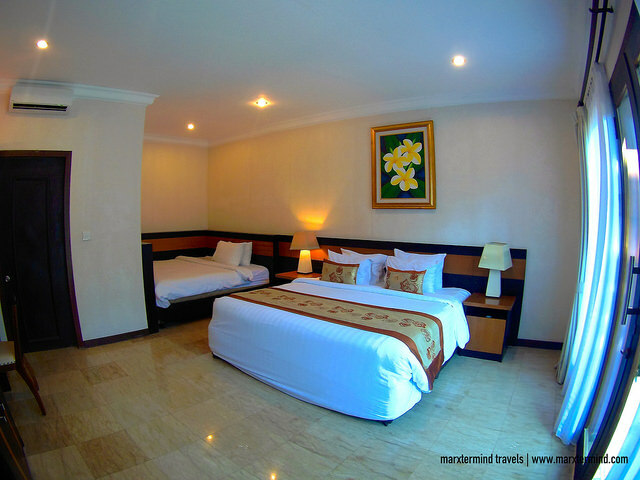 The room is spacious and conducive to relaxation after the whole days’ activities, with a large terrace and a spacious bathroom, almost of the same area as the bedroom itself. The room also features semi-traditional wooden furnishings and provides the standard amenities. If there is one known destination in Gili Trawangan, it is “The Swing”. Even online photos have sensationalized the landmark that it becomes mandatory to pay a visit. We are fortunate enough that the said “must-go-to-place” is right at the beachfront of our hotel. Yes it is scenic during sunset but definitely equally panoramic for whatever time of the day – high tide or low tide, only that it becomes more dramatic as a backdrop for souvenir photos when taken as the sun sets in the horizon. The swing is named as the Datu Swing. The name Datu is the traditional name for the highest royal caste in Lombok. A luxurious experience is what this swing imparts, that is when you sit on that swing and witness the grandeur of the sun descending behind the famed Mount Agung painted in hues of orange and red. It indeed felt surreal. Bean bags set up on the shores feels like watching theater shows or a concert on a front row seat. This is actually still part of one of the hotels’ in house-restaurant layout situated at the beachfront – the Sea Wind Bar and Restaurant. We opted though for a shaded beach side dining while at the said restaurant, on one of the cottages set up as we sip on our refreshments and mocktails before checking-out. The hotel being located on the peaceful Western side of Gili Trawangan and away from the hustle and bustle of the main center of the island, it is a relief that hotel personnel are friendly, not annoying and able to address our concerns immediately, making the stay indeed rejuvenating. Sometimes, we are posed with the dilemma of whether it’s worth going back and forth to the center of the island or just simply stay put and be comforted at the hotel.